St. Martin's Paperbacks, 9780312989705, 544pp. On a quiet park bench in Manhattan---just miles from the ruins of the World Trade Center---spymaster Jake Janos Illin delivers a chilling secret message to Jake Grafton: A rogue Russian general has sold four nuclear warheads to a radical Islamic terrorist group, the Sword of Islam. The group intends to detonate them in America in the ultimate terror strike, the apocalypse that will trigger a holy war between Western civilization and the Muslim world. After passing Illin's message to his superiors, Grafton is charged by the president with the task of assembling a secret team to find the warheads before America's population centers are consumed by a nuclear holocaust. As he hunts for the terrorists, Grafton soon finds himself up to his neck in power politics, techno-billionaires, money-grubbing traitors, anarchists, and spies. He also discovers that the terrorists don't all come from the Middle East. They come from places close to home. They masquerade as patriots. Some may even have the president's ear. With the survival of Western civilization at stake, Grafton pulls out all the stops. Calling on the assistance of the indomitable Toad Tarkington, and CIA burglar Tommy Carmellini, he raids the prisons to assemble his team while the clock ticks toward Armageddon. Peopled with the rich, vivid characters that have made Stephen Coonts famous worldwide, Liberty is all action and suspense from the very first page. And it poses the unanswerable question: How far should civilization go to defend itself from its mortal enemies? 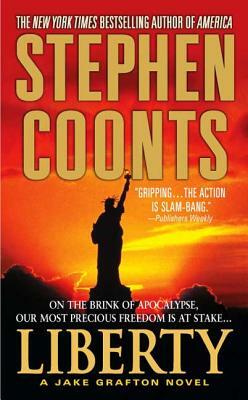 Stephen Coonts is the author of The Disciple, The Assassin, and the Deep Black and Saucers series, among many other bestsellers. His first novel, the classic flying tale Flight of the Intruder, spent more than six months at the top of The New York Times bestseller list. A motion picture based on the book was released in 1991. His novels have been published around the world and translated into more than a dozen languages. In 1986, he was honored by the U.S. Naval Institute with its Author of the Year Award. He is also the editor of four anthologies, Combat, On Glorious Wings, Victory and War in the Air. Coonts served in the Navy from 1969 to 1977, including two combat cruises on the USS Enterprise during the last years of the Vietnam War.